No reason to fret, and certainly no reason to shell out cash for any paid video converter apps, because you can usually remedy that error and convert a video to iPad format completely for free, all you need is a few minutes and QuickTime Player. Anything that opens within QuickTime Player will convert, and it’s extremely simple to do, and because QuickTime Player is bundled on every Mac and is also a free download for Windows users, the entire conversion process is free. We’re obviously focusing on the iPad here, but movies converted through QuickTime will also be viewable on an iPhone, iPod touch, Apple TV, and all other iOS devices. The only possible limitation is the output format, since older devices may struggle with high resolution video files like 1080p and 720p, thus if you are converting a movie for an older device like an iPad 1 or older iPhone, you would want to consider saving the video at a lower resolution such as 480p. You can choose 1080p from the pulldown and it will typically works well since .mov files will also play on an iPad, but for maximum compatibility and best playback performance choose the “iPad, iPhone, and Apple TV” option, despite being a reduced resolution of 720p. Only the newer retina iPads will even notice the 720p resolution difference, and even then it can be minimal if noticeable at all. On the other hand, standard display iPad won’t notice the difference in quality whatsoever. For old iOS devices, 480p may be the best format to use instead. Larger videos and movies will take longer to convert, shorter videos can be very quick. Once the movie is in the new iOS compatible format, simply transfer it back to the iPad (or iPhone/iPod) and the original error message will be gone. Once a video has been copied over to the iPad it is watchable through the Videos app. For obscure video formats, the popular Handbrake utility will do the job, and it also covers many options that QuickTime does as well. 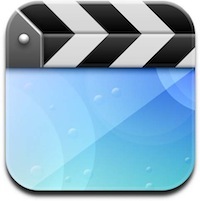 Handbrake is also free, but unless you’re working with a particularly obscure video format it’s not usually necessary just to turn a video into an iOS-viewable format. For MKV conversion, considering using the free tool called Subler, which relies on Perian to function but it will take an MKV file and turn it into an iOS compatible m4v rather quickly, you can read more about using Subler to convert MKV here. Finally, for Mac users running OS X 10.7 and later, there is also an excellent option to convert videos directly in the Finder by using the built-in encoder tools, which can be accessed by the right-click menu with any compatible video or audio file selected. 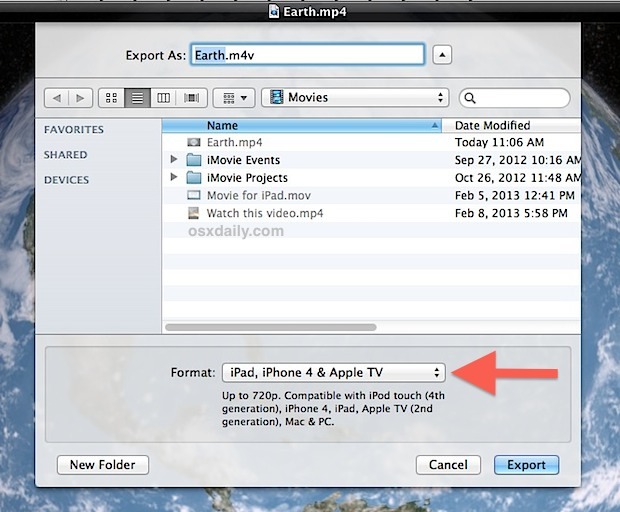 The same trick works to convert a video for iPhone and iPod touch formats. You should probably mention that! 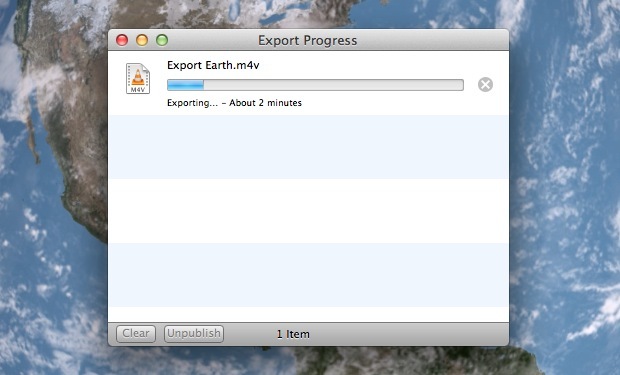 You don’t need Quicktime. Just right click on the movie file and choose “Services”, then “Encode Selected Video Files” and you can choose the export format. Any simple way to get the videos over to the iPad after conversion? I can’t sync any of mine back over. There is a easy solution- iDealshare VideoGo to converting 1080p to 720p step by step guide is provided as follows. It also helps to convert 720p back to 1080p. « iPhone 5S Production to Start Soon, Release Set for Summer?